This Mexican-Style Detox Salad with mangoes, soybeans, cabbage, kale, corn, and apple slices is just what the doctor ordered! 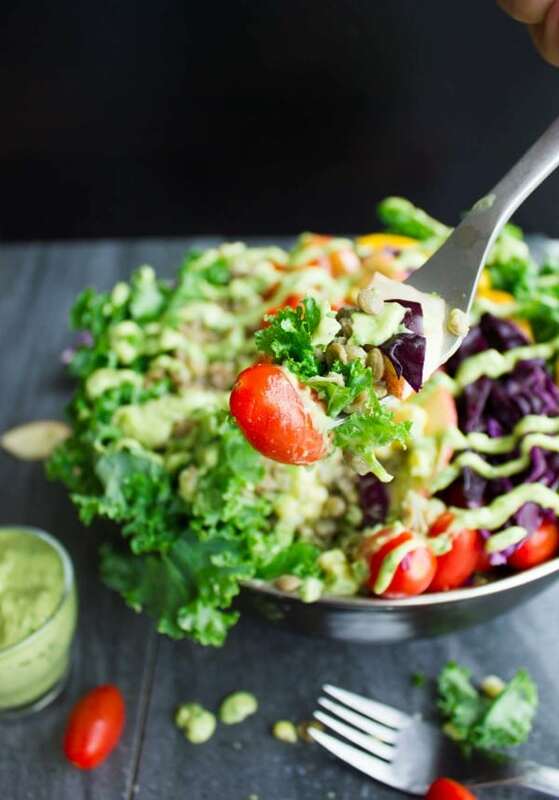 Serve this easy Mexico-inspired salad with my Green Goddess Guacamole Dressing for a healthy, vegan or paleo meal. So DETOX is kind of a buzzword right now. I meet friends and all I hear is detox, detox, detox. I go to pick up the girls from school, all the moms are into detox. Hubby comes back from work and says everyone asked him what he’s doing to detox. OK, I officially give up, it’s DETOX time for me too!! I’m ALL for healthy and detox but I’m not for making it feel like a punishment. Therefore, I’m having myself more of an “ay caramba”- fun detox time thanks to this gorgeous Paleo Vegan Mexican-Style Lentil Detox Salad! 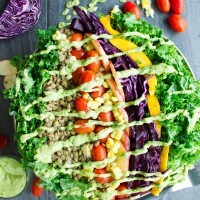 This Vegan Mexican Style Lentil Detox Salad recipe is just what the doctor ordered, only made DELICIOUS and satisfying! Tender soft cooked green lentils flavored with cilantro and lime juice, paired with a bunch of kale, sweet corn, sweet tomatoes, crunchy purple cabbage, sweet apples, and mangoes. 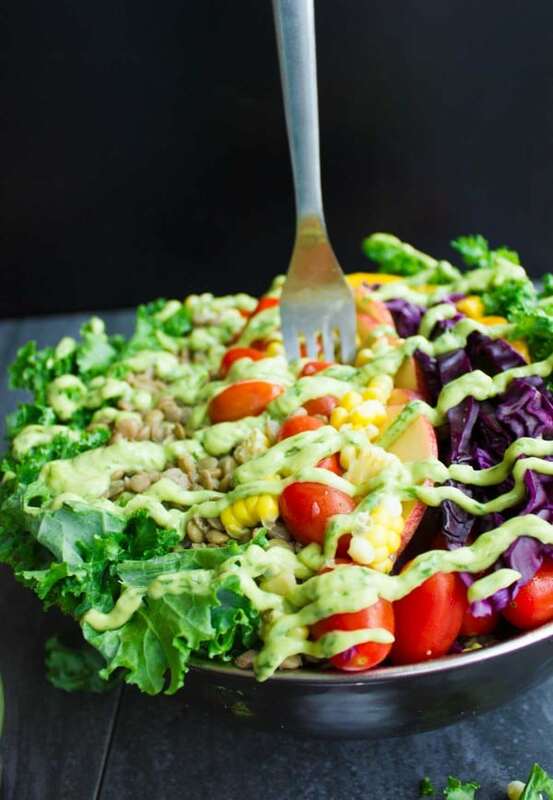 This vibrant vegan and paleo Detox Salad is seasoned with a silky-smooth, creamy Guacamole Dressing to perfectly round up the sweetness and textures! 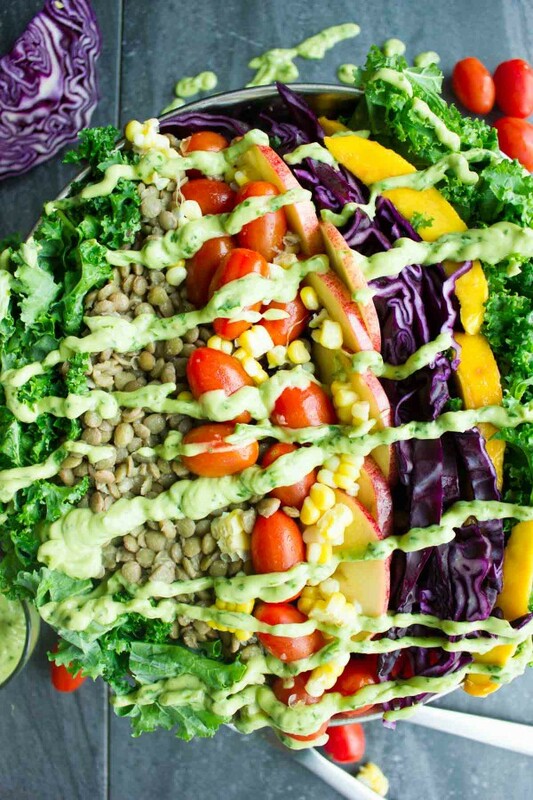 So take a look at this gorgeous, vibrant, lick-your-plate delicious Mexican Style Lentil Detox Salad! Why would this healthy Detox Salad feel like a chore, when it’s actually a pleasure! 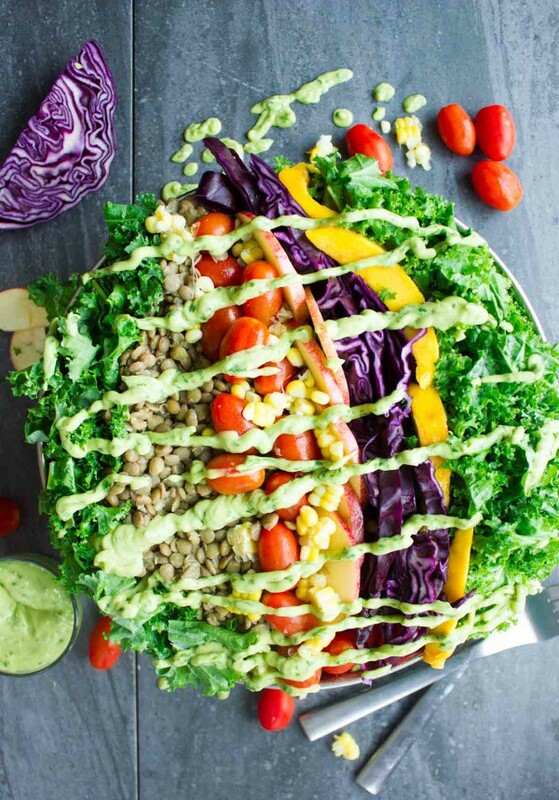 Let’s talk about variations on this Mexican Style Lentil Detox Salad! I like to use different veggies and fruits every time, so I encourage you to substitute pears, cucumbers, onions, white cabbage, soybeans, berries, pomegranate, sliced avocados, roast veggies and more! If you’re not a kale person, use spinach or salad greens, although if I were you—I would give kale second, third, fourth and a hundred more chances! It’s really good for you, it has a nice bitter taste which offsets it from other salad greens, and it has a nice bite too! Another thing I love adding to this Mexican Style Lentil Detox Salad is nuts—walnuts, almonds, pecans—whatever you have on hand. The PERFECT way to cook lentils is to start by rinsing your lentils under tap water in a strainer. Make sure the water runs clear before taking them off the strainer. Then, the water ratio I prefer is always 1: 2, so 1 cup lentils will need 2 cups water. Add the rinsed lentils and water in a pot and bring the water to boil, then lower the heat for about 20-30 mins max. until the lentils are tender. AVOID ever adding salt or lemon juice, or vinegar to the water before cooking the lentils—this will make your lentils hard. ALWAYS add the salt right after the lentils are fully cooked, but still hot enough to absorb the seasoning. For extra flavor, I always add a clove of crushed garlic to my lentil water. You can skip this step or add even more flavor—like onions, herbs, spices (not salt). Once the lentils are fully cooked, I salt them, add in olive oil, juice of half a lime and plenty of minced cilantro. And just like that lentils are done! In the meantime, you could prepare your veggies and fruits, so that assembling your Mexican Style Lentil Detox Salad takes only a minute. Oh, but what about the Guacamole Dressing? 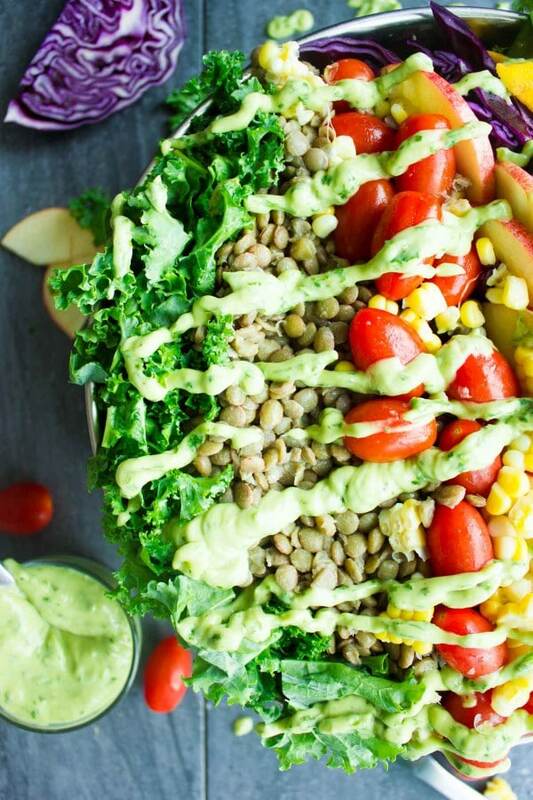 I like to serve this Lentil Detox Salad with a creamy, dreamy Guacamole Dressing, also known as Green Goddess Dressing. To make it, I use a mini food processor to which I add a peeled avocado, a bunch of cilantro leaves, a couple of scallions, a pinch of salt, the juice of 1 lime, a teaspoon of olive oil and 2 tablespoons of water. Process this Green Goddess Guacamole Dressing and you’re done! 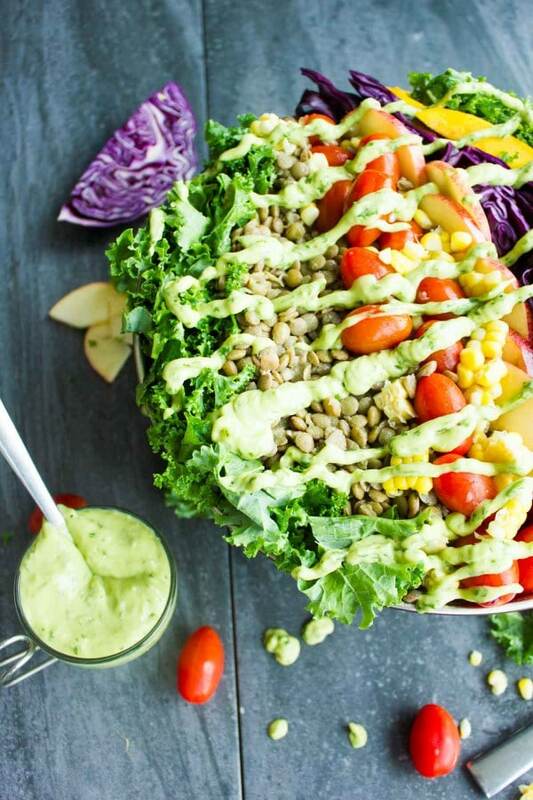 This AMAZING bright green dressing is absolutely worth every second and ABSOLUTELY what makes this Mexican Style Lentil Detox Salad stand out from the rest! Honestly, if I had to pick one thing for you not to skip or change in the recipe—it would be the Guacamole Dressing!! PS—I used this dressing before in this 10 min shrimp salad with avocado dressing, another Mexican-style salad worth making on busy weeknights! This Mexican Style Lentil Detox Salad is all about the lentils—but that’s not to say you can’t go for chickpeas, black beans or white navy beans—or a combo! I really urge you to try the lentils in this Detox Salad! Don’t like guacamole? As an alternative dressing, a simple splash of lime, olive oil, and salt will work great. As another dressing option can use this honey Greek salad dressing . This Mexican-Style Detox Salad with mangoes, cabbage, kale and apple slices is just what the doctor ordered! Serve this easy Mexico-inspired salad with my Green Goddess Guacamole Dressing for a healthy, vegan meal. Start by rinsing your lentils under tap water in a strainer. Make sure the water runs clear before taking them off the strainer. Add in the rinsed lentils, garlic clove and water in a pot and bring the water to boil, then lower the heat for about 20-30 mins max. until the lentils are tender. Then make the guacamole dressing: Add in all the ingredients in a small food processor and process until smooth and creamy. Adjust the consistency by adding more water if you prefer a thinner dressing, adjusting more salt, lime juice if you prefer and garlic! Assemble the salad and drizzle the guacamole dressing on top. Don't like guacamole? As an alternative dressing, a simple splash of lime, olive oil, and salt will work great. Fabulous!! Even though you went for the cheat option 😉 I can imagine the sumac gave it an extra tang too! So happy you liked this!! 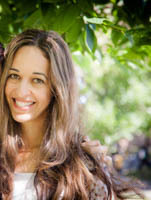 Hi Mahy! This salad looks so refreshing. I can definitely see myself making this for my spring detox regime. Thanks for sharing! what am awesome refreshing salad. love the lentils and am drooling over that green goddess dressing. perfect to bring to work with me! what an awesome recipe Mahy. I’m so with you on the not wanting to feel like eating healthy is a punishment. Thats why this salad is so great – wonderful delicious flavors! I think we can all benefit from a detox!! especially with that green goddess dressing – hello, delicious! Sounds like a super yummy & healthy salad! Will have to try it for lunch one of these days. And that dressing sounds absolutely amazing! I totally agree on detox not needed to be boring! I love this salad and the dressing is amazing. The avocado and cilantro gives such amazing and fresh flavors to the salad!